Clutches are more than just pedals, which you push before you change gears. They are, in fact, quite essential for the working of any machine. Explore the different types of clutches. Clutch is a mechanism for transmitting rotation, which can be engaged and disengaged. Clutches are useful in devices that have two rotating shafts. In these devices, one shaft is typically driven by a motor or pulley, and the other shaft drives another device. Let us take an instance where one shaft is driven by a motor and the other drives a drill chuck. The clutch connects the two shafts so that they can either be locked together and spin at the same speed (engaged), or be decoupled and spin at different speeds (disengaged). Depending on the orientation, speeds, material, torque produced and finally the use of the whole device, different kinds of clutches are used. The clutch in itself is a mechanism, which employs different configurations and different principles in various models available. 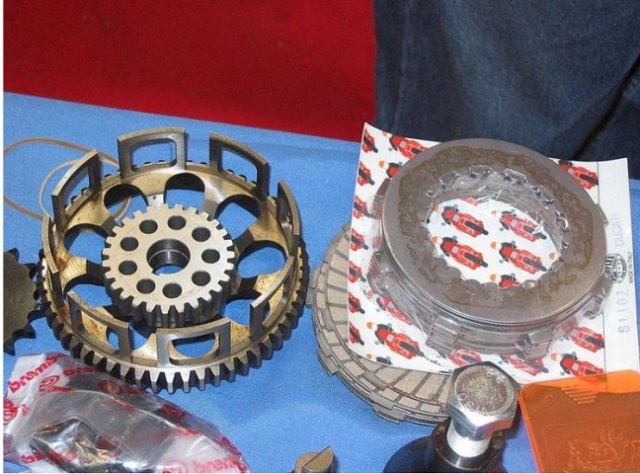 In the following lines, we have provided the different kinds of clutches that are available. Friction clutches are the most commonly used clutch mechanisms. They are used to transmit torque by using the surface friction between two faces of the clutch. A dog clutch couples two rotating shafts or other rotating components not by friction, but by interference. Both the parts of the clutch are designed so that one pushes into the other, causing both to rotate at the same speed, so that they never slip. Cone clutches are nothing, but frictional clutches with conical surfaces. The area of contact differs from normal frictional surfaces. The conical surface provides a taper, which means that while a given amount of actuating force brings the surfaces of the clutch into contact really slowly, the pressure on the mating surfaces increases rapidly. Also known as the freewheel mechanisms, this type of clutch disengage the driveshaft from the driven shaft, when the driven shaft rotates faster than the driveshaft. An example of such a situation can be when a cyclist stops peddling and cruises. However, in case of automobiles going down the hill, you cannot take your feet off the gas pedal, as there is no free wheel system. If you do so, the whole engine system can be damaged. Also known as the torque limiter, this device allows a rotating shaft to "slip" or disengage when higher than normal resistance is encountered on a machine. An example of a safety clutch is the one mounted on the driving shaft of a large grass mower. If a stone or something else is encountered by the grass mower, it stops immediately and does not hamper the blades. Centrifugal and semi-centrifugal clutches are employed where they need to engage only at some specific speeds. There is a rotating member on the driving shaft, which rises up as the speed of the shaft increases and engages the clutch, which then drives the driven shaft. In a hydraulic clutch system, the coupling is hydrodynamic and the shafts are not actually in contact. They work as an alternative to mechanical clutches. They are known to have common problems associated with hydraulic couplings, and are a bit unsteady in transmitting torque. These clutches engage the theory of magnetism on to the clutch mechanisms. The ends of the driven and driving pieces are kept separate and they act as the pole pieces of a magnet. When a DC current is passed through the clutch system, the electromagnet activates and the clutch is engaged.